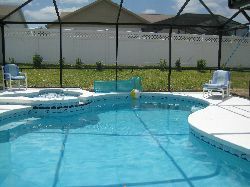 BEAUTIFUL EXECUTIVE VILLA,20 MINUTES FROM DISNEY. THE HOUSE IS FULLY AIR CONDITIONED AND SITUATED ON THE PRESTIGIOUS ORANGETREE ESTATE IN CLERMONT.IT HAS 4 BEDROOMS 2 OF WHICH ARE EN-SUITE AND HAVE DIRECT ACCESS TO THE POOL AREA. 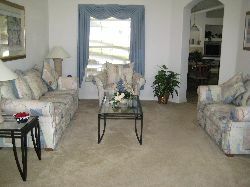 EACH BEDROOM HAS ITS OWN CABLE TV AND EITHER DVD OR VIDEO PLAYERS.THERE ARE 2 LIVING ROOMS AND A FULLY EQUIPPED KITCHEN. 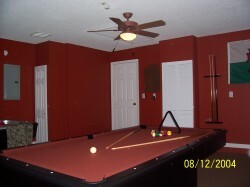 THE GAMESROOM HAS A FULL SIZE POOL TABLE, AIR HOCKEY, ELECTRONIC DARTBOARD AND CABLE TV WITH SONY PLAYSTATION. THE POOL AREA HAS A HEATED POOL AND THE SPA IS IN THE SHAPE OF MICKEYS HEAD IT HAS PRIVACY FENCING ALL AROUND. ALL THE USUAL PATIO FURNITURE IS SUPPLIED TOGETHER WITH OUTDOOR BBQ.